Clean the surface of each semidemihemisphere with isopropanol or something else that dries clear. Assemble each hemisphere with big wads of epoxy clay filling in the gaps between the four semidemihemispheres. Then slather the assembled hemisphere in more epoxy clay so that it’s fully covered. Then leave it until the clay cures. Sand down the epoxy clay until the plastic shows through (I used a 120-220-400-800 grit progression of sandpaper). Coat with lacquer to make it shiny. I used shellac at first, then switched to polyurethane as it was easier to use (shellac has a very short work time and also discolours in water) and food-safety wasn’t a concern. I actually did step 2 in reverse because I’m a terrible engineer and didn’t think to seal the gaps between the semidemihemispheres with clay until after I’d done the outer surfaces. Epoxy clay turned out to be an effective material for smoothing and sealing 3D prints. I bought 2 ounces of the reddish-brown (“flesh” coloured) stuff on eBay and later supplemented it with a 1 lb. white batch of the unsettlingly spelled Apoxie Sculpt from Sculpture Supply Canada (n.b. what I discovered regarding the difference between Apoxie Clay and Apoxie Sculpt). The clay doesn’t adhere well to ABS as you’re applying it, I had to keep my fingers lubricated with water so that I could press the clay into the object’s filament ridges without the clay sticking to me. (The water also made it easier to smooth the clay out so that I could squish it into a thin layer that was quick to sand down.) Once the clay cures it’s really fricking hard to get it off of whatever it’s on, but it sands and drills cleanly. 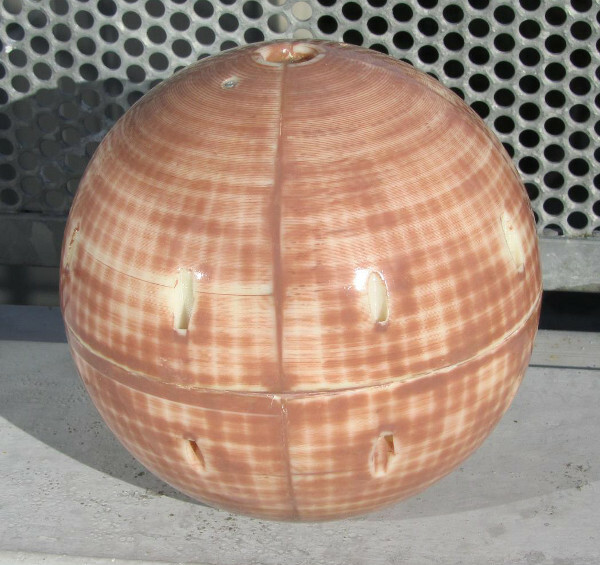 The clay can also be used for filling holes and errant curves (e.g. due to the bottom of a print curling up as it cools) and for making good-looking, smooth, heat-resistant surfaces (I made a totally sweet coaster). It also takes acrylic paint a little better than ABS plastic does, which isn’t saying much. Another miraculous substance that I’ve discovered is Plumbing Goop. It’s clear, creates a thin layer, is very easy to apply, and sticks really well to ABS. It doesn’t peel off like silicone rubber. It also provides a rubber-like grip, something that bare ABS is sorely lacking. The downsides: because it’s applied in a thin, clear layer, it’s harder to get a thorough seal with Plumbing Goop than with epoxy clay; it doesn’t make spherical prints look like Jupiter; it doesn’t smooth out the filament ridges; and it’s flexible (comparable to silicone rubber), which might not actually be a downside depending on what you’re doing.